KV331 Audio announces the release of version 2.5 of their semi-modular synthesizer and effect plug-in SynthMaster. 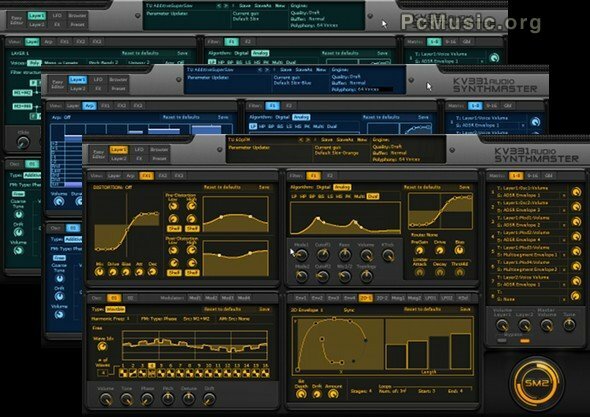 With version 2.5, SynthMaster becomes a cross-platform plug-in running on Windows (32/64 bits) and Mac OSX (32 bits) operating systems in VST and AU formats. The latest version comes with 400 new factory presets, while introducing new filter types, improved filter algorithms with pre/inside/post distortion routings, stereo oscillators with improved unison, vector synthesis with 2D envelopes, sample playback (SFZ) synthesis, improved arpeggiator, improved modulation architecture, improved easy parameters, online preset browser, multiple skins, flexible effects routing, improved effects as well as 3 new effects: Phaser, Ensemble and Compressor.